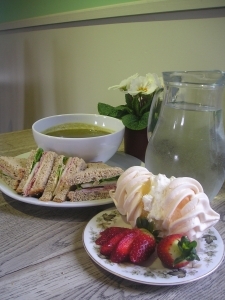 Our award-winning tearoom is a treat for all. We are known for the freshness and quality of our cakes, soups and sandwiches. All our cakes are made on the premises by our own staff. Our scones are made fresh every morning – we don’t keep them or freeze them. Soups are freshly made and suitable for vegetarians. We have now crept into the modern world and invested in a microwave – but we never use it for cooking, only for softening our butter for baking, warming up our delicious hot puds, and savoury specials, and of course for heating up baby food. We always have a good range of gluten-free options available. Home made soup with a choice of two each day, always interesting and suitable for vegetarians and usually gluten-free. We try to use seasonal produce whenever possible, and use vegetables from the Woodside garden, and from Emma’s own garden when available. Sandwiches – we offer a choice of seasonal sandwiches made to order using top quality ingredients and a premium seeded batch loaf. We usually have at least two sandwiches suitable for vegetarians and our sandwiches often feature our home-made chutneys using produce from the garden. Drinks – freshly ground coffee from rainforest alliance certified beans, tea, hot chocolate, fruit juice, mineral water and Fentiman’s fantastic botanical brews from Newcastle! You can have tap water – it’s free, except that we hope you will make a donation to WaterAid – a charity that provides safe water, sanitation & hygiene education to the world’s poorest people. Cakes and biscuits all freshly made by the cafe team. We nearly always have shortbread, meringue, Victoria sponge cake, chocolate log and whatever else takes our fancy! We try to use fresh produce so you’ll get rhubarb and orange cake when there’s rhubarb from the garden, and we try to use as many apples, pears and plums as the trees will produce. We also use delicious raspberries and strawberries from Emma’s own garden. There are always gluten-free cake options available. Special of the Day – we often have a special dish of the day available. In the summer it’s often a freshly baked savoury tart using ingredients just picked from the garden. If you’re really lucky then Homity Pie might be on the menu. It’s a perfect blend of leeks, potatoes, cheese and cream on a pastry base and baked to perfection until soft and gooey. We serve it with a mixed salad from the Woodside garden. During the winter months we serve a hot special, such as Lentil Curry, Vegetable Tagine or traditional Stovies. Afternoon Teas – We are delighted that our wonderful afternoon teas have been awarded the Bronze award in a national competition to discover the UK’s greatest. 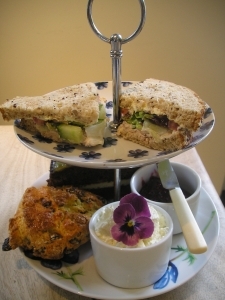 So why not treat yourself or buy a voucher for “Afternoon Tea For 2” to give to a friend. We much prefer it if you book in advance, that way we can offer you our favourites. All the Woodside staff have lunch from the tearoom, and we have fun sampling all the food on offer, so if you need a recommendation just ask one of the team! We hope you enjoy our food as much as we do.